« Gromit Unleashed ads unleashed! A Grand Tail is a slapstick romp around some of Bristol’s most iconic locations, to publicise the unveiling on 1st July of 80 life-sized Gromits painted by a host of high-profile celebrities and artists, including Harry Hill, Cath Kidson and One Direction’s Zayn Malik. The summer trail and film are aimed at families and couples looking for a UK break or ‘staycation’. The film features two hapless delivery drivers trying to drop Gromit off in time for the Trail, but getting hopelessly lost in the city. Tourist attractions in the city include Bristol Zoo, Clifton village, the Harbourside area of town, where the SS Great Britain is docked, two theatres, the recently revamped music and comedy venue Colston Hall, Bristol Museum and @Bristol (a science museum suitable for adults and families), two cinema complexes, plus an enormous range of restaurants and the recently-built Cabot Circus shopping area. Other attractions include the Clifton Suspension Bridge, the Downs, and Leigh Woods. The artist is Thomas W. Dowdeswell; whose piece ‘Being Gromit-Malkovich’ incorporates an abstract cityscape in a Vorticist style. It is an industrial yet contemporary construction which strikes an interesting balance with the historic engineering of Brunel’s ss Great Britain. And thanks to the folks at Carbon Costume who create “Famous outfits made from everyday gear” and also reached out to show me a couple recent posts featuring Wallace and Piella Bakewell costumes! 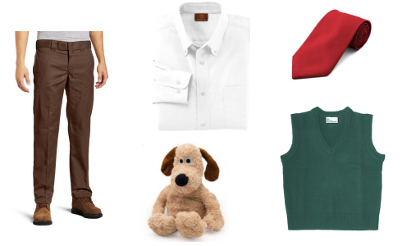 See the Wallace costume here and Piella here. This entry was posted on Wednesday, June 19th, 2013 at 9:44 am	and is filed under News. You can follow any responses to this entry through the RSS 2.0 feed. Both comments and pings are currently closed.